Wisconsin Rapids, Wis. - The Rafters are to 4-3 in the second half standings with a 19-23 overall record this season after the 5-0 shutout of the Rockford Rivets. The Rivets fall to 1-6 on the second half with an overall record of 19-22. Last night Gareth Stroh (Purdue), took a no hitter into the seventh for the Rafters. He retired the first nine batters of the game and only allowed one hit in his start. 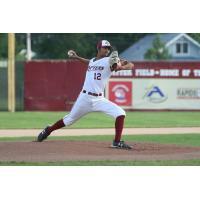 Stroh was selected as Northwoods League Pitcher of the Night. On the mound for the Rafters tonight is Trayson Kubo, he sports a 3-1 record and a 1.68 ERA so far this season. In his 32 innings pitched, he has struck out 28 batters and allowed 21 hits. This will be Kubo's seventh start of the season. Pitching for the Rivets will be Alex Bacevicius. He has a 0-0 record and will be starting for the first time this season. In his two innings pitched, the lefty has given up four hits. The Rafters have one more game left in this three game homestand tomorrow against the Green Bay Bullfrogs. Tonight's first pitch is slated for 7:05 p.m.